If your looking to give archery a try or you want to start winning gold medals, Heights Archery Academy has a program suited to your needs! We offer classes for beginners who have never held a bow, 6-month development programs for high-level competitors, and everything in between. Certified Archery instructors who help design programs that set our athletes on the path to success run all of our classes. I have never shot a bow, which class is right for me? 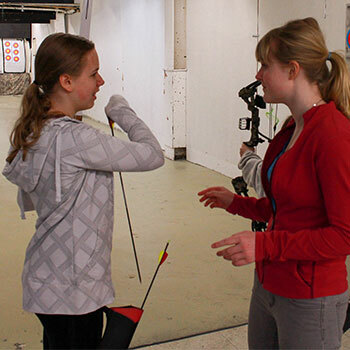 The 5-week beginner archery class is the perfect choice for you. 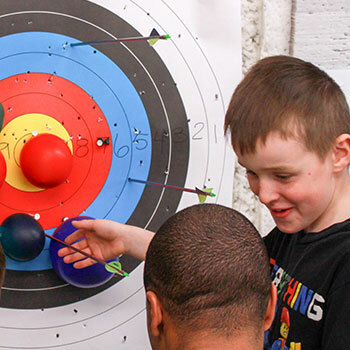 This 5-week program focuses on basic archery shooting fundamentals, archery range shooting procedures and rules, archery range etiquette, SAFETY, and of course, FUN! By the end of program you will certainly get a good feel for what archery has to offer. We take students at 8 years old and up for all of our intermediate 1 lessons. Students 6 years old and up are welcome to join our beginner lessons. Our intermediate 2 and advanced classes are determined by the archer’s development and skill level. Adult lessons are ages 18 and up. I have my own bow and have been shooting a little bit, should I still take the beginners class? Archers with some experience can either take the beginners class or jump right into the Intermediate 1 class. If you are not sure where you should start please contact us and we will be happy to discuss the available options for you. When are the classes offered? Classes are offered from September through May but the dates vary depending on the class. Below is a general guideline of class times, but please check here for class schedules and start dates. The cost of the classes depends on what program you're in. Below is the fee schedule for the different class levels. For the Beginner, Intermediate 1 and Adult classes all the equipment will be provided to the students. Once the students reach the Intermediate 2 class and beyond, they require their own equipment.